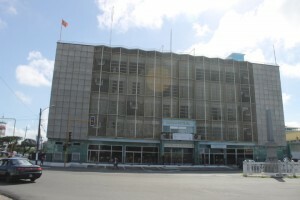 Guyana Bank for Trade and Industry’s headquarters. A significant portion of the total loan portfolio held by Guyana Bank for Trade and Industry (GBTI) is non-performing as it experiences a severe hangover from an expansion that saw its loans and advances increase by 140% in only five years, but senior officials of that commercial bank and a Central Bank expert on Friday assured customers that they have no need to worry. “For us in Guyana, we have enough provisioning in terms of the non-performance; the provision means that they have to make a provision to ensure that if anything happens with the loans, it is well secured so we don’t have situation where there is a non-performing loan or a sector that we don’t have the wherewithal to ensure that the persons’ monies are safe,” the expert who is familiar with the Bank of Guyana’s operations said. According to the Bank of Guyana Quarterly Financial Indicators for Commercial Banks as of March 2018 GBTI’s ratio of non-performing loans to gross loans reached a high of 29.78%. This compares to 6.27% for Republic Bank; 9.69% for Scotiabank; 7.25% for Demerara Bank; 12.37% for Citizens; and 27.67% for the Bank of Baroda. The industry average is 13.2%. This deterioration of the quality of GBTI’s loan portfolio went hand in hand with a massive expansion of lending. Between 2010 to 2015 GBTI saw its loans and advances increase from $19.3 billion to $48 billion. This has now declined to $44 billion in 2017 as the bank has taken a conservative approach to lending. Meanwhile the non-performing loan ratio went from 6.78% in March 2010 to 16.62% in March 2015 and now to 29.78%. “The NPLs remain an area of concern,” wrote Executive Director Richard Isava in the company’s 2017 annual report. He also said the bank was making progress to address the high level of non-performing loans. “Our relentless efforts to remedy these loans have proven fairly satisfactory. These loans are significantly collateralized and coupled with our increased loan provisioning: losses are expected to be minimal,” he said. 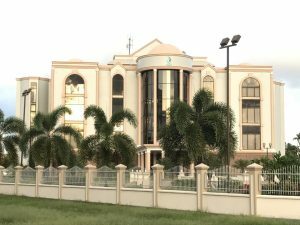 To compound matters, the bank also suffered a massive financial fraud when in April 3rd 2017, gold dealer Saddiqi Rafeek Mohamad Rasul was charged with defrauding the bank of $941 million. GBT’s non-performing loans net of reserve for loan losses/ capital and reserves reached 59.6% ; this compares to the industry average of 22%. Service (39%) and Manufacturing(20.2%) sectors make up the bulk of GBTI loans. Related party loans make up 9.3% of gross loans, the highest percentage of all the banks. A financial expert highlighted that a significant part of their portfolio is indeed loans which are past due. Of a total of $48 billion, $4 billion is past due between 90-180 days while $8 billion is past due over 180 days. In that regard, the former Bank of Guyana official explained that GBT has “more than adequate provisioning and the capital adequacy is over 20 percent so they have enough capital there and the provisioning is high so they are well secured and people’s monies are not in jeopardy; no way whatsoever,” he said. Among the options available to commercial banks to deal with non-performing loans are debt write-offs or sale of the loans especially in the real estate sector. The former Bank of Guyana official said the Central Bank ensures that commercial banks “abide by its rules and regulations” by adequate provisioning and there is adequate capitalisation to ensure “depositors funds are secured and even the banks are sound”. Recently-approved legislation that empowers the Bank of Guyana to provide Emergency Liquidity Assistance is also available to commercial banks in trouble, the former Central Bank official said, as “it makes it easier on them in the event there is a shortage of liquidity beyond what is regular to go to the Bank of Guyana and say ‘we need some financing, take whatever collateral from us’ and give them what they need so it makes for more flexibility for them and for the Central Bank to ensure that there is no major fallout”. The Bank of Guyana expert said the problem of non-performing loans dates back to 2008 when the external economy “wasn’t doing well and after a while that would impact on us”. “We have also seen some of the impacts on our economy, our sectors and especially when there was a drop in commodity prices some of our sectors were showing a decline in growth , a decline in exports so it would have hit the non-performing sector,” the official said.Mostly affected were wholesale and distribution sectors.